It’s Teacher Appreciation Week, America! All over the country, millions of educators can look forward to a free burrito. Or maybe an Arby’s sandwich. Or a complimentary donut. Because we REALLY appreciate teachers here. I don’t mean to seem ungrateful. I’ll redeem my coupon at Chipotle. I’ll take that Roast Beef Classic. I’ll grab that Dunkin’ Cruller. But let’s be honest. These cheesy buy-one-get-one coupons don’t demonstrate appreciation. They’re guilt. They’re a manifestation of the feeling that we SHOULD appreciate teachers, but don’t. Not really. Not for one week, not for one day! Why else would we begrudge them a middle class income? Why else would we provide them with so few resources and so much responsibility? Why else would we bar them from making any meaningful decisions about how their students should be taught yet hold them accountable for everything their students do? Appreciate teachers? We don’t LISTEN to them. We don’t RESPECT them. Many of us don’t even LIKE them. The only time we value teachers is when a maniac enters a school with a gun. Then – when they protect our children with their very lives – then we praise them as heroes! On that day and that day only. But every other day – not so much. We won’t do anything to keep guns out of the hands of school shooters. At most we want to arm teachers – Great! Something else to be responsible for on top of education, counseling and children’s all around well-being. But otherwise, we won’t do anything to help teachers do their jobs. And we certainly won’t listen to their professional opinions on anything! That would be living in a culture of life. But we live in a culture of death. We do the barest minimum for children – especially poor and minority kids. Instead we invest in parasitic business interests that provide zero value for students and parents. 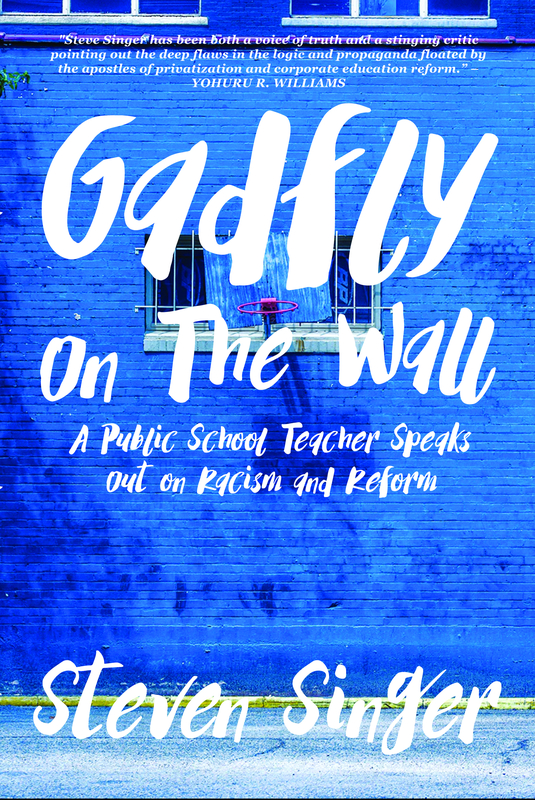 We’ve got nothing for teachers or proven educational practices but we throw public money at charter, private and parochial schools that only accept the cream of the crop and turn down everyone else – yet still rarely do better than inclusive public schools. We defund public schools until they can no longer operate – and then we close them as failures. We promote lightly trained Teach for America temps to the same status as authentic educators with a 4-5 year degree and decades of experience. And we do everything we can to bust their unions and take away collective bargaining rights. Yet everywhere I look I see people congratulating themselves for donating to some teacher’s GoFundMe project. This may come as a shock to you, but we shouldn’t be resorting to charity to fund our public schools! That should be a given! In almost every classroom in America, teachers reach into their own pockets to make up the difference when our federal, state and local governments come up short. When kids don’t have pencils, we provide them. When kids don’t have books, we buy them. When kids come to school hungry, we even feed them. Yet you’re getting excited that anonymous folks on the Internet put a few virtual coins in the cup! I’ve been a public school teacher for almost 15 years. Next year I can look forward to another increase in class size. And I’ll probably have to teach an additional grade level or two. No extra resources to help me do it. No extra salary. Just more of a drain on my time to get the job done. And if I somehow stumble and fall, it will be my fault. It won’t be the federal government’s fault even though they keep providing less financial help and more standardized testing, Common Core, and so-called school choice policies that rob my district of necessary funding. It won’t be the state’s fault as they refuse to heal years worth of budget cuts in order to lower taxes on the wealthy, a scheme that, by the way, did nothing to boost the economy – in fact, it actually stalled business development. Nor will it be the state’s fault as they continue to blame me for the high cost of pensions they forgot to pay years ago while both my district and I paid on time. Nor will it be the state’s fault as they try to strip me of sick days, preserve loopholes that benefit charter schools at my district’s expense and experiment with a new funding scheme that further drains my district’s coffers. It won’t be my local school board or administration’s fault, either, as they make cuts to core educational resources so they can preserve the state champion football team and less vital faculty office and administrative staff who are only working there because of nepotism and/or politics. It’ll be MY fault. Mine and mine alone. That’s how much we appreciate teachers. And none of it is even close to changing. No one is even considering altering the tiniest fraction of it. Democrats, Republicans, Independents, men, women, black people, white people, gay people, straight people, the young, the old – no one is doing anything about it! And why should we? We’ve already got a scapegoat. We’ve already got someone to blame. Well, look in the mirror, America. Because you’re the one to blame – each and every star-spangled banner and amber wave of grain. We’ve made it like this. All of us. I don’t mean to be so negative, but all these Pollyanna platitudes about that one special teacher obscure a basic truth. As individuals, we sometimes appreciate teachers – often when we’re years beyond graduation, or sometimes only when we’re parents, ourselves, and see what they do for our children. But that’s personal. That’s individuals. When we think about the nations teachers, when we think about the profession in general, we don’t appreciate them one bit. Because if we did, we’d act much differently. If we really appreciated teachers, we’d hire more of them. We wouldn’t demand they do more with less. When we were deciding school policy at any level – federal, state or local – we’d include them in the process – in fact, they’d be the deciding factor! If we really appreciated teachers, we wouldn’t wait – as many folks do – until they call us to find out how our children are doing in school. We’d be proactive. And if our kids aren’t doing well, we wouldn’t blame the teacher. We’d hold our own kids responsible and look for solutions. If we really appreciated teachers, we wouldn’t blame them for their summer breaks. We’d understand that they aren’t paid for this time yet they often take professional development courses on their own dime or work retail just to make ends meet. If we really appreciated teachers, we’d respect them as professionals, and we’d pay them accordingly. We’d respect their rights to a positive working environment both for themselves and for our own children. So seriously – you can stuff your ridiculous Teacher Appreciation Week. A free cookie just isn’t going to do it.